What’s behind the recent surge in the interest of angels? Why do some seem to have a preoccupation about them? God created angels with a purpose, just like He did with us, and even the creation, as the Psalmist declares, “The heavens declare the glory of God, and the sky above proclaims his handiwork” (Psalm 19:1), and “Day to day pours out speech, and night to night reveals knowledge” (Psalm 19:2). If you’ve ever been out on a moonless night in the country, and gazed up at all the stars you can see, imagine how much greater is their Creator! So angels have a purpose, and mostly that purpose is that they are messengers of God. They are not to be revered, idolized, or be the center of our attention. That place is reserved only for Jesus Christ. 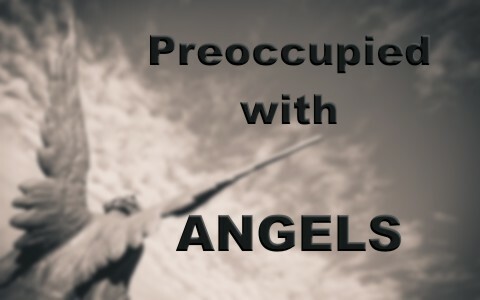 The Hebrew word for angels is “mal’ak,” which translated, means “messenger,” or “representative,” and the root of the Hebrew word “מֲלְאָךְ” means “to dispatch as a deputy; a messenger; specifically, of God.” Angels do have other duties, but they do not act as independent agents. They do God’s bidding and cannot be influenced by demons or humans. That’s why it seems strange that some even pray to their own “special angel,” which is strictly prohibited by God’s Word. We are to pray to the Father, through the Son, in the Spirit. Even if angels dispatch those prayers to God, those prayers are directly sent to the Father, through the Son, or in His name. We pray in His name so that answered prayer may glorify Jesus’ name. That’s a huge purpose in prayer. In the Book of Revelation, when the Apostle John sees an angel, he falls at his feet, but the angel rebukes him, so when he “heard and saw them, I fell down to worship at the feet of the angel who showed them to me, but he said to me, ‘You must not do that! I am a fellow servant with you and your brothers the prophets, and with those who keep the words of this book. Worship God” (Rev 22:8-9). If that were the only command in the Bible to not worship angels, that would be enough, but there are other places where we’re told to worship only God and Him alone. We are not to fall down before angels, or anyone or anything else. That place is reserved only for God. I’ve heard of and read of a few people’s experiences with what they thought were angels, but to be honest, there are times that believers have encountered angels and not even known about it (Heb 13:2), but they’ve been worshiping angels for a very long time, and even in Paul’s day, they took this angel thing a bit too far. Paul writes, “Let no one disqualify you, insisting on asceticism and worship of angels, going on in detail about visions, puffed up without reason by his sensuous mind” (Col 2:18). Those things take our eyes off of Christ and onto the person. It makes us focus on angels rather than their Creator. John warns us to keep ourselves from idols (1st John 5:21), and angels cannot only become a preoccupation, they can become an idol. There are even magazines about angels, and some believe that they have their own special angels whom they can communicate too, but this is nothing short of sin. Seeking the kingdom first should be our priority, and that means seeking the King of that kingdom and His righteousness (Matt 6:33). Even seeking the help of angels is not biblical. The Lord is our Rock and our Refuge. To Him we run, not to angels. There are 23 mentions of angels in the Book of Revelation, so if we want to know more about angels, that’s a great place to start. The angels in the Book of Revelation are messengers of God, and they are sent to the Apostle John so that he can record the messages to the seven different churches. Some believe these are the seven different church ages, but these were seven actual churches that existed in the day John wrote them. Whether or not they were intended only for the first century churches, or are a glimpse of the churches through the ages, we can say for sure that these messengers all came with different messages for the seven different churches. God could have spoken from heaven and John could have written down those words, but the Book of Revelation is not really John’s book. It is not the Apostle John’s Book of Revelation, but in fact, “The revelation of Jesus Christ, which God gave him to show to his servants the things that must soon take place. He made it known by sending his angel to his servant John, who bore witness to the word of God and to the testimony of Jesus Christ, even to all that he saw” (Rev 1:1-2). Jesus had the revelations, He gave the revelations to John, but Jesus used angels to deliver many of those revelations. It was not John’s message or the angels message, but “the revelation of Jesus Christ, which God gave” to John. If you are or you know someone else who spends an inordinate amount of time with angels, I would express my concern for them or for you. If our focus is taken off of Jesus, we’ll begin to sink in our Christian walk, just like Peter did when he took his eyes off of Jesus and looked at the wind and waves. We would be better served to ask God to give us a hunger and thirst for Him and His Word. Pray for a deep desire to worship Him and Him alone, and if you’re going to be preoccupied, be preoccupied with Jesus. He alone is worthy of our worship and our praise and all of our attention. Besides, the angels won’t accept our worship anyway. More about angels: What Do Angels Look Like? Next post: What About Christians Who Live Like The World? Are They Saved?